It is well known that migratory birds have adapted the timing and altitude of their migratory journeys to take advantage of prevailing tail winds that result from global climate patterns. 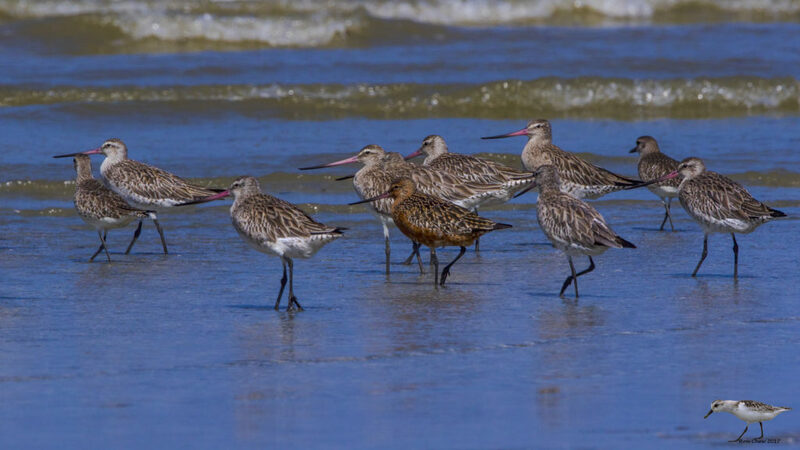 For example, Bar-tailed Godwits breeding in Alaska can use favorable wind patterns after the breeding season to make their non-stop journeys to New Zealand. 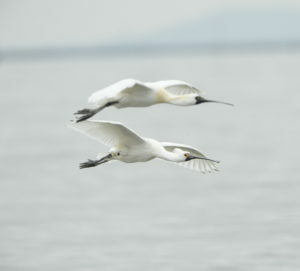 In the spring, when these birds depart from New Zealand, the weather conditions do not facilitate a trans-Pacific journey and the birds migrate through the Yellow Sea. While birds may be able to avoid storms and cold weather fronts by gaining altitude, inevitably some individuals get caught up in these and become displaced, like the New Zealand Bar-tailed Godwits, banded at Miranda (Firth of Thames [EAAF019]) , which recently turned up in Oregon instead of Alaska, or that die crossing the ocean, like the sad case of Black-faced Spoonbill H15, a young bird banded at Namdong Reservoir in Incheon on June 20, 2015, which tried to migrate north several times from its wintering location at Dingshan in Taiwan in April and early May, but each time was forced back. It tried again to cross the East China Sea on 11 May 2017 and almost made the coast of Hangzhou in China, but changed the direction off shore and headed again south. It seems that after flying over 1,000 km during 42 hours without any stop, H15 became exhausted, and dropped into the ocean and presumably drowned, perhaps as a result of strong headwinds at the time. One of the impacts of climate change is that ocean currents are shifting and weather patterns are becoming less predictable. The incidence of hurricanes and storms is increasing but also shifting in time and species, with uncertain effects on migratory waterbirds. A recent study looked at this issue for Sooty Tern. Another recent study in our Flyway looked at the impact of climate change on weather conditions, particularly thermals, for a soaring bird, Oriental Honey Buzzard. These changing conditions add an additional layer of potential complications for migratory birds already struggling with a set of adverse environmental changes, such as habitat loss at stopover sites.